Healthy chocolate cherry zucchini muffins made with whole wheat flour, honey, and fresh summer produce. A treat you can feel good about! Perfect for breakfast or an afternoon snack. I’ve always enjoyed baking, but layer cakes have really only been a recent passion of mine. One of my first baking loves was actually muffins! There are so many reasons to love muffins in my opinion. One being that they are so versatile and can fall anywhere on the spectrum from really healthy to overly indulgent. And another being that they are perfect to keep on hand for quick breakfasts, or to grab right before heading out the door for an easy snack. Given all the decadent desserts I make around here, I tend to make my muffins on the healthy side. I usually make a big batch of them whenever we have extra produce in our fridge. It always feels good to sneak veggies into something that seems like a treat! These chocolate cherry zucchini muffins were dreamed up this summer after realizing I had a ton of cherries and zucchinis that we weren’t getting through quickly enough. I always seem to have this problem after a trip to the farmer’s market! Is it just me?? Something about an early Saturday morning at the local farmer’s market makes me overly excited about buying fruits and veggies. In fact, as I’m writing this, I have a whole bunch of zucchinis I need to use up before we go out of town this weekend. 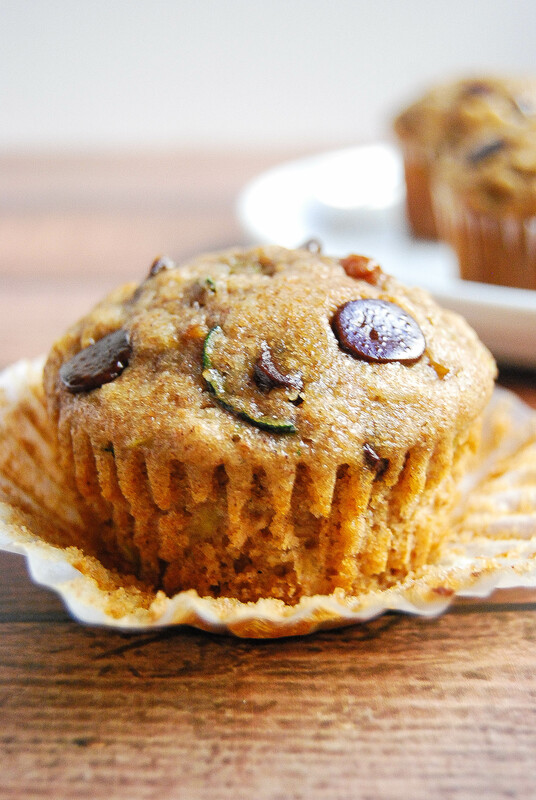 Don’t be surprised if I end up making more zucchini muffins to freeze (and yes, they do freeze really well)! To keep these chocolate cherry zucchini muffins healthy, I used whole wheat flour and sweetened them with just a touch of honey. The cherries add little bursts of juiciness in each bite, and I decided to add chocolate chips for a little indulgence. I mean, we do still have a sweet tooth over here! Here’s a helpful tip: sprinkle a few chocolate chips on top of the batter in each cup right before baking. That way, you get the double benefit of a little extra chocolate and prettier muffins. I serve these muffins warm from the oven (or, warm them in the microwave for about 10 seconds) and eat them as-is. However, you could certainly add butter, honey, or cream cheese if that’s your style! Preheat oven to 375 degrees Fahrenheit. Prepare muffin tins with muffin liners. This recipe yields about 16 muffins. Whisk flour, baking powder, baking soda, cinnamon, and salt together in a medium sized bowl. Set aside. In a separate bowl, beat eggs, honey, buttermilk, oil, and vanilla extract. Create a well in the middle of the dry ingredients, add wet ingredients to dry and mix together with a spatula or wooden spoon until just combined. Batter may be lumpy. Add shredded zucchini and oats. Fold into batter until just combined. Add cherries and chocolate chips. Fold into batter until just combined. Spoon batter into muffin cups, filling each one about 3/4 of the way full. Bake at 375 degrees for 10 minutes, then lower temperature to 350 degrees. Bake for an additional 7-8 minutes, or until a toothpick inserted into center of muffin comes out clean. Let cool 5 minutes in pan, then transfer muffins to a wire cooling rack and let cool completely. *I make my own buttermilk by measuring a scant 1/2 cup of either 2% or whole milk and adding about a teaspoon and a half of white distilled vinegar or lemon juice. Stir and let sit for 5 minutes before using. I bet they’re even better if the zucchini comes straight from your garden!